Great Sedona Chili Cook-Off Coming! Yavapai College's Culinary & Hospitality Director Robert Barry told the club about YC's newest certificate programs: Hospitality and Culinary Arts, based at the Sedona Center. Robert said the Culinary Program will graduate its first class in May. Both programs are transferable to Northern Arizona University. YC's Culinary Institute also offers restaurant Safe Food Certification. Robert's experience includes Chef for the San Antonio Spurs, Union Pacific Railroad, ownership of two restaurants in Omaha, and production of his own Buffalo Bob's BBQ Sauce. He's also the newest judge to join this year's Great Sedona Chili Cook-Off. Robert invited club members to tour YC's Sedona Culinary Institute. 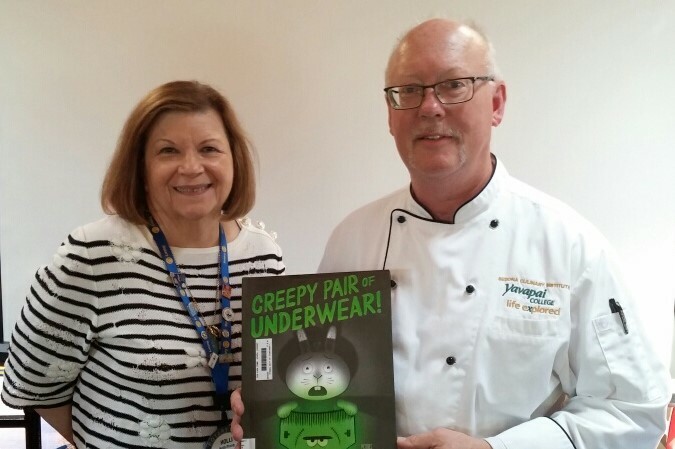 Club President Holli Ploog announced the book "Creepy Pair of Underwear!" will be donated to a local Sedona School on Robert's behalf.